Well it’s a common secret that Greece is a unique destination! It is surrounded by the emerald Mediterranean Sea with thousands of islands and islets all around it, it has a lush mainland with beautiful mountains and green valleys, it has a long lasting history with several monuments all over the country and it has a diverse lifestyle. One can find many reasons to go there at least once in a lifetime. It has a mild Mediterranean climate, a rather warm sun most of the year and a clear blue sky that seduces your senses. Greece is also the origin country of philosophical thought, Western drama, medicine and several other sciences of the Western civilization. Furthermore, it is well known for its ideals of togetherness, the joy of life and its simple pleasures. Although the list of highlights in this adorable country is long and offers various views and settings, we have selected 10 of the most popular things to see or do in Greece for your holidays. Our list includes several diverse things and we feel that they capture the essence of Greece. Add to it all the cultural features and the vibrant lifestyle and prepare for the experience of a lifetime. A lot of couples prefer and vote for it again and again in various lists for their weddings or their honeymoon. 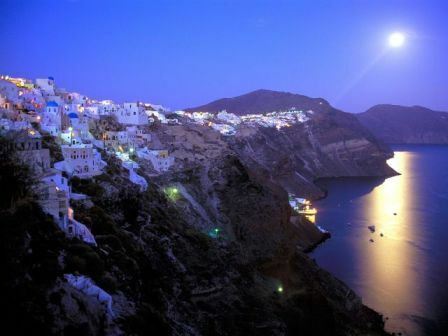 Well, Santorini is an idyllic destination to live in heavenly bliss. Perched on the cliffs of a volcanic caldera (crater) it will amaze you with stunning views of typically Cycladic white-washed homes and blue-domed churches with the Aegean blue and the caldera on the background. 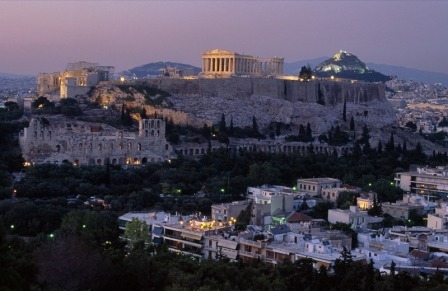 The Acropolis rises high and proud and it is Visible from any corner of Athens. The internationally-renowned Parthenon manifests the unsurpassed grandeur of the Ancient civilization. It is built entirely of marble and it hosted a giant statue of Athena, the city patron goddess. A visit in the Acropolis is a must; no visit is complete without climbing the rocky temple. Stone-paved paths will lead you to a lot of monuments columns and temples glowing in the sunlight. At night it is beautifully illuminated and it is a wonderful view that you will always remember. 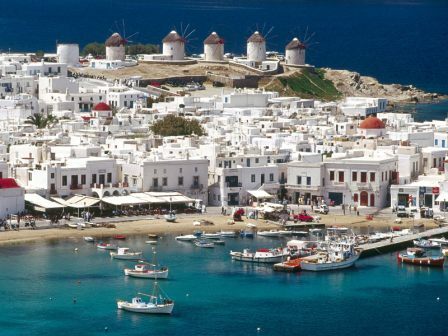 Vibrant Mykonos with its cosmopolitan atmosphere, celebrities and fashionistas and its highly energetic nightlife, is a world class destination that will make you party. This popular Cyclades island challenges visitors with its vibe of hustling streets, music, oiled-up and suntanned bodies. There are several high profile beaches and bars and some others more relaxed and lounge spaces where you can enjoy your drink or food all day long. The main town or Chora as it known is full of picturesque stone-washed houses with navy blue balconies and colorful stores for a delightful shopping experience. The least you can do on your Greek holidays is to visit the Acropolis and the Sanctuary of Asklepios at Epidaurus. A healing and cultural center dating from the 4th century which is one of the purest masterpieces of Greek architecture, dedicated to the god of medicine will definitely stun you. The Theater with its ancient splendor will carry you away; just take a rest up high on the ancient stone seat, marvel at the intact Orchestra reaching 20 meters in diameter and imagine who might have been sharing your limestone spot hundreds of years ago. This you should not miss! However picky you might be, there is a sunny spot for you in Crete. There are plenty of secluded beaches with soft white sand and beautifil coves with glistening colored pebbles, a lot of long golden sandy beaches and several rocky coastlines with superb views and waters. Actually there is every kind of beach that sun-lovers dream of. You can do all sorts of activities and sports, walks and a lot of others. The most popular ones include the tropical palm beach of Vai, Elafonisi with soft white sand and thousands of corals, Falasarna with its beautiful golden sand and the ancient ruins, Paleochora with several beautiful beaches nearby such as Sougia, Preveli with a stunning scenic of the river floating to the sea in between palms, Matala, Sfakia, Agios Pavlos, Ierapetra and so many others. 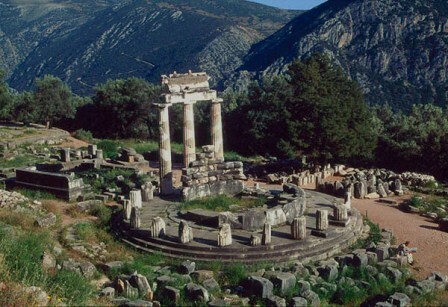 Acclaimed as the center of the Earth and Universe, Delphi has always been a place of historic and spiritual significance. The ‘navel of the world’ where the omniscient Oracle was to be advised blends harmoniously with the magnificent landscape and it surely is an absolute must destination for any history lover. Although the eternal flame is no longer burnt inside, a visit to the Temple of Apollo is obligatory. 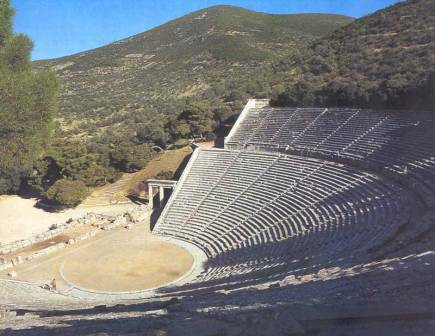 It is well known that there are numerous sites in Delphi to explore including the Athenian Treasury, the Theater and the Stadium as well as the Tholos and many, many more. 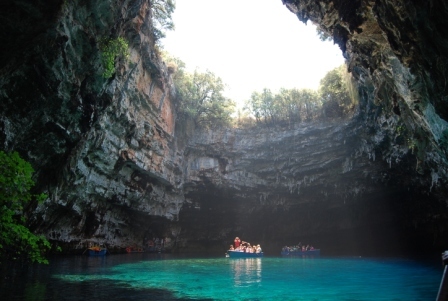 An impressively beautiful scenic in Kefalonia; a sea cave with magical ultramarine water and monumental walls all around it. The sea path is mostly roofed but it reaches a point where the partial collapse of the inner cave’s roof forms an extraordinary scene. And regardless of whether you gaze down from the edge of the cliff or observe the spectacle of light and water from within the cave, you will surely admit it was an extremely lucky accident. Sensations not to be described in words! 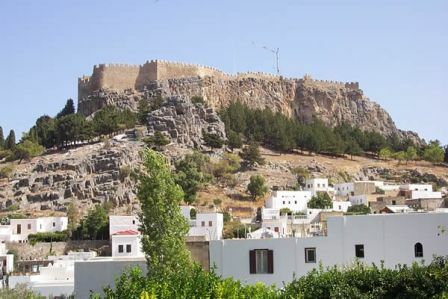 The Acropolis of Lindos is a fascinating site. It is a 4th century BC temple of Lindia Athena surrounded by a medieval castle located on an imposing rock offers a splendid view of sugar cube whitewashed houses nestling on the slopes. And besides the significant historical value of the place, you can always enjoy an invigorating swim in the crystal waters of the Lindos Bay or a relaxing sunbath on Tsambika beach famed for its golden sands and turquoise waters. 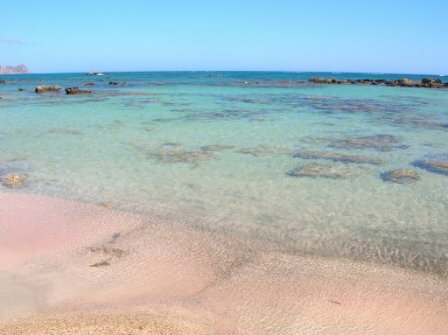 The beautiful island of Rhodes is full of long golden sandy beaches with wonderful waters! 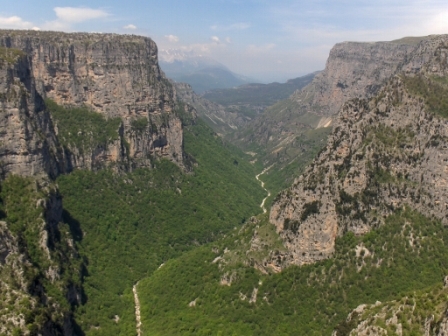 The magnificent Vikos Gorge is a truly inspirational and spiritual experience. Named one of the deepest gorges in the world – although some opt for Grand Canyons superiority – the views unveiled from almost anywhere you point your camera will leave you speechless. Passing a long way through adorable villages situated in lush, evergreen scenery and Byzantine monasteries and over the 18th century stone bridges, the hiking trails a perfect option for physical workout besides the breathtaking views. If you think that grapevine is the symbol and attribute of Dionysus, a visit to the archaeological site of Delos will surprise and eventually prove you wrong. When you reach the platform of the Stoivadeion dedicated to the god of wine and the life-force, you’ll surely notice on either side of the platform a pillar supporting a colossal phallus. 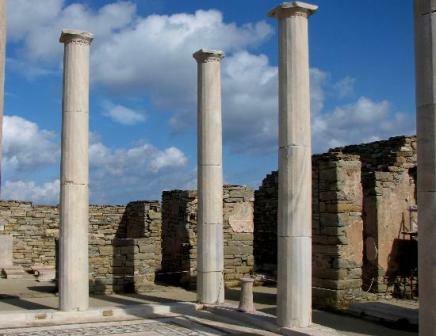 Delos, considered an ancient But lest you limit your interest to this site and only, the sacred island of Delos is a goldmine of landmarks. Serving as a holy sanctuary long before the Greek mythology made it the birthplace of Apollo and Artemis, it features such splendid sights as the Minoan Fountain, the Terrace of the Lions, the Doric Temple of Isis, and the age-old Synagogue. Well, our first top-10 list for Greece is that. But there will be more in the near future to complement and extend it. After all the country is endless in terms of sites and it covers all aspects of cultural and morphological interests. Although the prime time for visiting Greece is summertime, the country is a true bliss in spring and in autumn as well. The climate is mild and warm, there are fewer visitors at those times and you get to enjoy fantastic vacation deals at both these times. Besides the affordable accommodation deals, you usually get transport discounts. And of course what is more is that you get an authentic, personalized and genuinely kind service. And you get the superb views and sights for your eyes only! Just think about it when you plan your holidays in Greece. This entry was posted in Travel and tagged accommodation deals, accommodation offers in Greece, affordable holidays in Greece, delos, greek islands, greek rentals, holiday homes, holiday rent club, holidayrentclub, holidays in Greece, houses for rent, rodos greece, sandy beaches rhodes, summertime, turquoise waters, vacation properties, vacation rentals, vacation rentals chania. Bookmark the permalink. Top 10 in deed! very informative text, thank you! Wow, Greece is is on my list, thank you for this very informative text! A great read, in deed. I was looking to book a trip to Greece this summer, and this blog gave me amazing insight…:)! Thanks a lot, B.